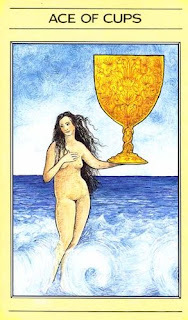 Apple River Tarot Readings - It's Not The Destination, It's The Journey: Ace of Cups - What's Love Got To Do With It? emotional energy abounding some where within the context of my life, depending on what I choose to do with it, and how it is directed and channeled. We see here Aphrodite, the goddess of Love that is embodies the potential for compassion and intimacy. This card is a representation that urges me to be compassionate toward myself and have an intimate knowledge of who I am, both the positive and negative aspects of my personality. It's really about accepting and loving myself as I am. This isn't an easy undertaking and often takes years of work and maybe therapy for many of us. I remember over 20 years ago before my own personal recovery, I was rightly told that, I had to learn how to re-parent and love myself. I was as mad a hell. I'd been care-taking most of my life, making sure others were happy, putting my own needs and wants on the back burner, letting people use and abuse me. I felt like once again I was expected to, and was going to have to be the one to do this 'taking care' of myself, when what I really wanted and needed I thought, was for someone else to take care of me for a change. I figured this was only fair. This in fact was due to having grown up with unmet needs when I was a kid, and it carried over into my adult life, and I acted this out through my co-dependent relationships, until I finally understood how to really re-parent and love myself. It meant changing myself and changing my relationships. Many of us, if not all human beings are a work in progress. When it comes to love and intimate relationships, what's love got to do with it? If I don't have a healthy relationship with myself, being really happy and content with my life as it is, I can't expect someone else to either fix me or to make me happy. That's my responsibility. It's really a simple kind of equation and formula, but many of us get wrong, time and time again. We just have to look at the statistics and observe the high incidence of divorce. Taking an inventory of how we define our relationships with ourselves and with others, is a very important factor to consider as we more forward in our lives, regardless of our status and whether we are single. married or other. Tina Turner figured this out. She is someone I greatly admire. A great post and so recognizable. Thank you Ellen for your great comment. It's can be a long road we walk to understand that it connects our heads to our hearts. I've come to understand Ellen, I don't walk this road alone. There is always another set of footprints beside mine. That's for sure Ellen! We're being carried by strong arms!